After an active day of playing or learning, your children can relax themselves by a chair that can rock and unwind. leek and modern design makes this unique rocking chair fit your front porch, patio or gazebo well. Stylish wide slats offers your children a comfortable seat. Settle in and rock it slowly! Heirloom quality, rocking chair will be part of your family for years. ♥ Premium Quality - Constructed by Natural Cotton Wood which resists warping or twisting for years of using. Paint in environmentally friendly paint which is non-toxic to ensure the security for your children to use. ♥ Modern & Comfortable - Sleek and modern design makes this unique rocking chair fit your front porch, patio or gazebo well. Stylish wide slats offers your children a comfortable seat. Settle in and rock it slowly! ♥ Armrests and footrest add extra comfort for your children! With large weight capacity of 80 lbs, it will accompany your children for a long period of time of relaxation. 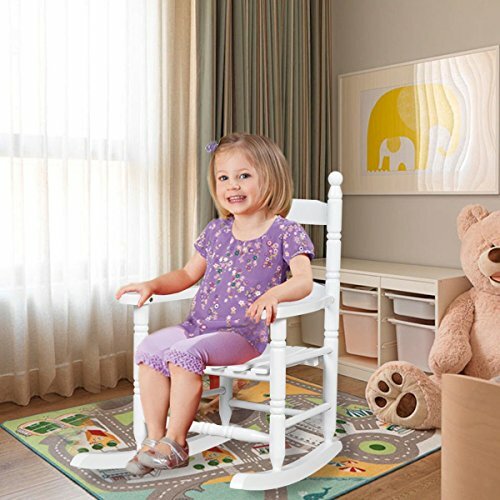 ♥ Even though this rocking chair is sturdy and durable, it is light weighted and removable. Your kids can easily lift the chair by themselves and move it to any place they prefer conveniently. ♥ WORRY FREE PURCHASE- We at Costzon stand behind our products with our Satisfaction Guarantee. We not only offer qualified products with favorable price to our customers, but also great customer service.